4.6 / 5 Score from 8 reviews. Location: St. Ivan Rilski Hotel Spa & Apartments is located at 5 minutes driving distance from the gondola ski lift in Bansko mountain resort. Distance to the ski lift - 800 m.
Accommodation: The property includes four residential buildings with 5 single rooms, 52 double rooms, 46 double rooms with separate beds, 70 family stylish apartments, 4 maisonettes with panoramic view to the Pirin mountain, 22 studio apartments, located in the apartment houses behind the hotel. 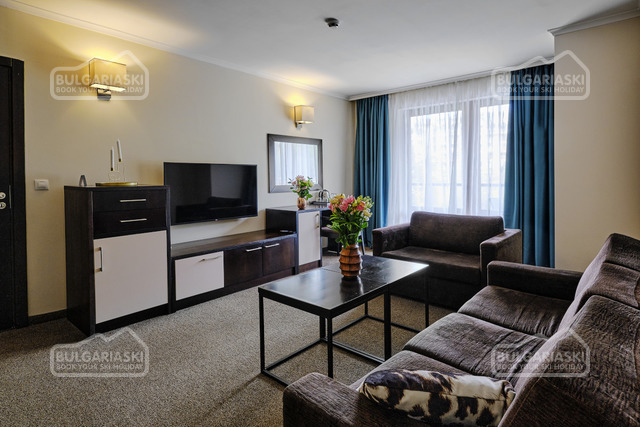 The apartments feature TV with satellite programs, telephone, mini-bar, Internet, kitchen, balcony. The Moderato restaurant with 200 seats in the in-doors part and 30 seats on a terrace offers healthy meals from Bulgarian, European and Mediterranean cuisine, as well as a selected wine list. The restaurant is an ideal place for cocktails, weddings and parties. The Chanove Tavern with a fireplace offers local specialties and traditional Bulgarian meals. At guests' disposal is a wine cellar for 200 guests. 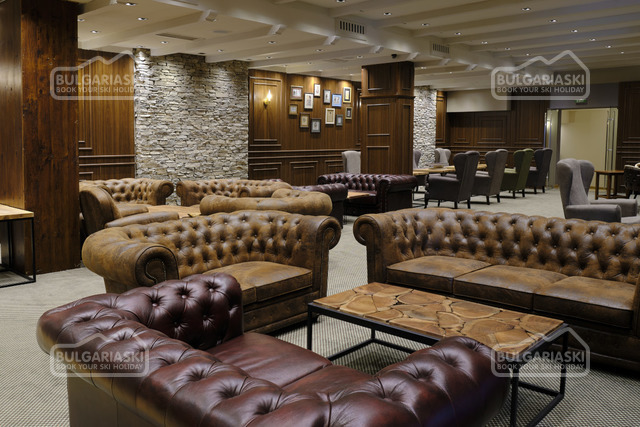 The lobby bar with 80 seats and beautiful mountain views is a perfect place for business meetings. Conference facilities: There are 3 conference rooms that can be united in one hall with 150 seats suitable for conferences, trainings, business events. The rooms are with natural light, Wi-Fi ineternet, multimedia, sound system, flipchart, screen, air-conditioning, telephone. A conference bar offers 20 seats. The business centre offers office services such as computer, fax, printer, Internet, telephone etc. Spa and Wellness: The SPA and wellness centre features indoor swimming pool, solar terraces, sunbeds and parasols, saunas, Turkish bath, steam bath, Ice-room, 3 massage rooms, fitness centre, relax room and different wellness procedures and programs. Services: Parking, Room service, internet, medical centre, kindergarten, ski-lockers, telephone, etc. I have just returned home after staying in one of the double bedroom apartments. The apartment was of an excellent standard and the hotel was every bit as good as the 5 star Kempinski Hotel that I stayed in last year. 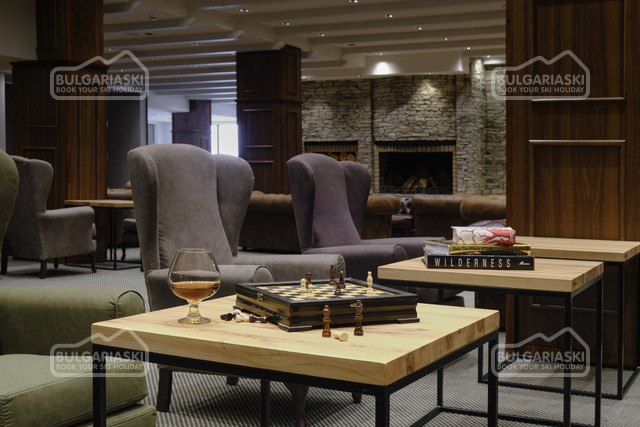 The facilities, food and staff were excellent and I will definitely be returning to Bansko and staying at the St. Ivan Rilski during the coming ski season. 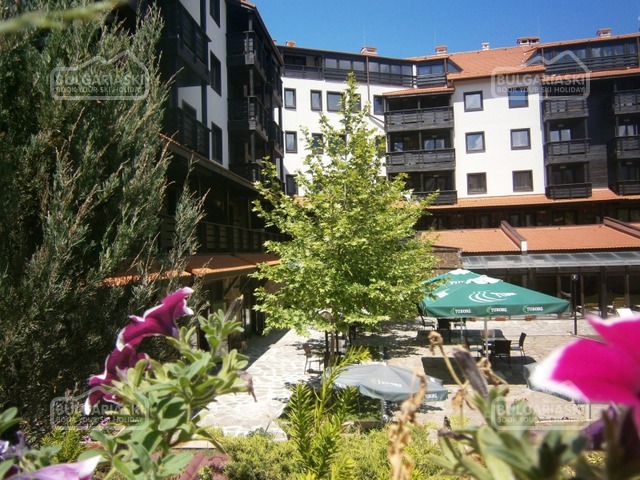 Please, post a comment on St. Ivan Rilski aparthotel, Bansko. * The rates are in EUR, per room/apartment per night with breakfast included. Transfer to the first station of the Gondola is provided during winter season. The rates include use of steam bath, fitness, swimming pool, sauna, fitness, ice room. Parking - 5 Euro per day. * Maximum occupancy: Double room/Studio – 2 adults + 1 children or 3 adults; 1-bedroom apartment - 2 adults + 2 children or 3 adults. * Cancellations can be made, providing details of this are received at least 10 working days prior to check-in day - cancellations made after this period will incur a fee equivalent to the cost of the 3 nights of the accommodation and catering! Cancellations for the period 28 December - 03 January can be made min. 30 days before the check in date and cancellations made after this period will incur a fee equivalent to full amount for the accommodation! Any changes of the reservations after the Early Booking periods are deemed as cancellation and will be considered as new reservation. Breakfast at the hotel did not change for 7 days, a bit disappointing. This is my first time with BulgariaSki.com! I'm very impressed and satisfied with your service, highly recommend to my friends and hope to be in touch with you again!! !